What is a Melbourne big ticket? Do I have to visit LEGOLAND Discovery Centre Melbourne on the same day? What age is classed as a child for a Combination Ticket? How far is LEGOLAND Discovery Centre Melbourne from SEA LIFE Melbourne? With 90 days validity, combine your SEA LIFE Melbourne visit with a trip to our sister attraction LEGOLAND Discovery Centre Melbourne located inside Chadstone Shopping Centre. LEGOLAND Discovery Centre is fun for the whole family with 2 rides, 10 LEGO build & play zones, a 4D cinema, MINILAND featuring all of Melbourne's top attractions made from LEGO - and much more! 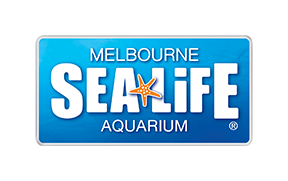 - You MUST visit SEA LIFE Melbourne FIRST on your chosen day. - You may visit LEGOLAND Discovery Centre anytime within 90 days after your SEA LIFE Melbourne visit. For more information and to book please visit here.